"Go see Cal, go see Cal, go see Cal!" Mad Men has given us a picture of what advertising was like before the Don Drapers and Peggy Olsons began pulling it toward what we think of as cool modernity. Here's an ad that represents the very opposite of what Don and Peggy believed in, yet which in its time was very successful. The first 30 seconds will give you the idea. 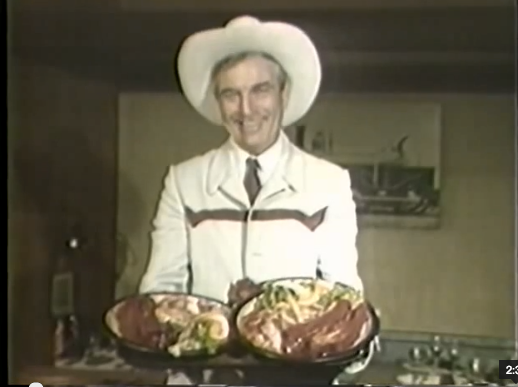 The ads for Cal Worthington's car lots always looked home-made. They always featured the same jingle, they ran so often that they seemed to constitute their own TV channel, and most of them featured the "dog Spot" schtick. "Here's Cal Worthington and his dog Spot" -- which was an anaconda, a bison, a camel, a horse, a pro football player, a killer whale (seriously), or anything but a dog. The "two free dinners" offer shown at the top of this post, and that appears about 30 seconds into the clip, illustrates the tone I remembered from seeing these things on Saturday morning TV shows. Cal's ads came across as campy and self-mocking even then, in the 1960s. But they were effective because they also had a non-joking aspect. I always thought that their cornpone approach connected with the sensibility of a lot of Californians who, like him, had grown up or farms or amid Dust Bowl devastation on the prairie and had come west during the Okie-era and post-WW II great migrations. Cal Worthington died over the weekend, at 92. The NYT and the LAT have nice obituaries. Below is a highlight reel of his ads, including the orca segment and his wing-walker performances (he had been a bomber pilot in WWII). The airplane stunt was in keeping with his slogan, "I will stand upon my head until my ears are turning red to make a deal." This is America.